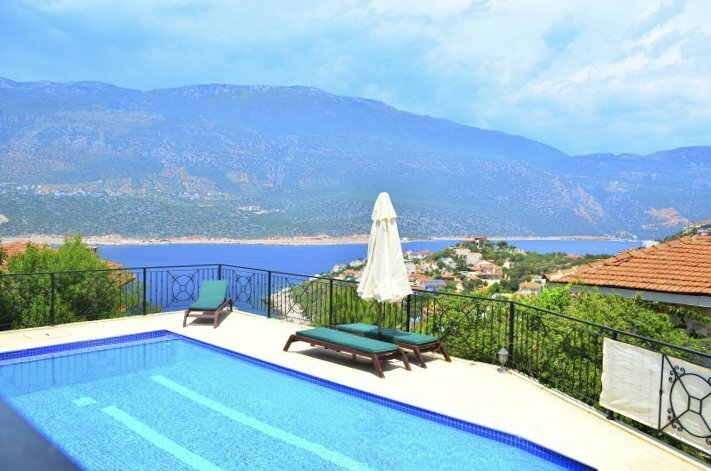 Charming 4 bedroomed Villa Cukurbag perched on the peninsular, on the outskirts of the picturesque seaside town of Kas. Charming 4 bedroomed Villa Cukurbag perched on the peninsular, on the outskirts of the picturesque seaside town of Kas. This private villa enjoys marvellous views of the glittering Turquoise Coast - a sublime destination for an abundance of rest and relaxation. Having a large and inviting pool, a glorious garden and spacious terrace, Villa Cukurbag is something of an oasis - tailor-made for a luxurious Mediterranean getaway. If you want a dip in the sea, the shared swimming platforms are cut into the rocks, just 150m away. Villa Cukurbag sleeps 8 - two of its rooms have large double beds - making it an excellent location for a large family or group holiday. The villa's interior does not disappoint. Tasteful furnishings are complemented by the large airy living spaces and the house is well served by excellent kitchen facilities and air conditioning throughout. There is a bookshelf full of books as well as free Wi-Fi and a TV with cable access and DVD player. The cool marble floors and soft colours give the villa an airy, mellow feel while the private balcony is an excellent spot to tuck into a holiday novel or simply spend long happy hours absorbing the extraordinary vistas. The immaculate and colourful garden, as well as the surrounding scenery of Villa Cukurbag, is a hugely attractive feature. The house is itself a pretty example of Mediterranean style - think rustic stone, shutters and balconies – with contemporary aspects. The azure pool has the perfect vantage point from which to take in the sea view and the grand Taurus mountains. When night falls, guests can congregate on the wide patio for either an al-fresco dinner under the stars or you may decide to fire up the on-site barbecue. The tranquil feel of Villa Cukurbag is in keeping with the laid-back vibes of the surrounding harbour town of Kas. The town is colourful and vibrant and offers a plethora of activities for visitors. It boasts a great store of cultural jewels with the well-preserved Hellenistic amphitheater and the ancient ‘Lions Tomb,' amongst others, only short distances away. Kas is a charming hillside harbour town with the villa sitting on a superb position on the Cukurbag peninsula, just out of the main town. To the left of the Peninsula is the Greek island of Meis. On the right are the Taurus mountains which provide the spectacular backdrop to Kas. With a regular dolmus (minibus) service running into town and a reasonable taxi service, you get to enjoy the cool breeze on the peninsula and can take off into Kas at anytime. Despite a blossoming tourist trade, Kas has retained much of its historic charm and character. The cobbled streets are draped with pink Bougainvillea flowers and the houses fronted by marvelously archaic Ottoman balconies. The town's vibe is often described as bohemian; friendly and laid back and it boasts an exciting array of restaurants and shops to match all tastes and budgets. The natural setting of Kas is breathtaking. Framed by the ever-changing hues of the Mediterranean and the dramatic Taurus mountains beyond, it is difficult to imagine a more sumptuous backdrop. Kas is literally steeped in history. Built as it is around the remains of the ancient city of Antiphellos, it is unsurprising that it is within close proximity to myriad cultural attractions. The remarkably well-preserved Hellenistic Amphitheatre simply hums with a glorious atmosphere of antiquity and history. Other historic sites - including the Lions Tomb and the Kas Ataturk Statue - are easily accessible. It's worth a drive to Cukurbag village to see the ruins of Antiphellos, which is one the Lycian Way walking route. For the adventurous at heart, Kas will not disappoint. Visitors can trek, climb and canoe in the surrounding Taurus mountains while for those who fancy a beach canter, popular horse-riding tours take place on the much celebrated Patara Beach. For the very intrepid there are a number of paragliding centres. But during the hot summer months it is into the cool sea that many will be drawn and here Kas will not disappoint. Known for its excellent diving and snorkeling opportunities, there are several great dive sites. Here divers can glide around an Ottoman ship wreck, the remains of a WWII plane and a reef formed arund an old lighthouse- experiencing the piquancy of a real underwater adventure. The sunken city off Kekova Island - destroyed millennia ago by an earthquake - is popular for snorkelling and a boat trip is definitely recommended, as the area is truly beautiful. The region is rich in marine life with the Loggerhead Sea Turtle - which happily habituates this coastline in numbers - being a notable example. For those more inclined towards lazy hours basking in the sun, there is Kaputas beach - 18Km west of Kas - the stunning white sands of which are hidden away behind Patara's ancient ruins and the village of Gelemis.There are lots of beaches and beach clubs scattered along the coast, or you can take the watertaxi from the harbour to Limanagzi or one of the beaches across the bay. Demre, where St Nicholas was bishop, and the ancient city of Myra are both an hours drive away. Slightly further afield there is a fabulous site at Arycanda, in land of the coastal town of Finike. There is a weekly market in Kas every Friday. A boat trip on the turquoise seas is an unmissable day out. If you find you're intrigued by the site of the Greek island of Meis just 2km off of the Turkish coast, you can get a day trip. Be prepared to hand in your passport and go through a lot of protocol but it's a worthwhile trip never-the-less.